Snow and strong winds during Marquette’s most recent winter storm created blizzard conditions so intense, several snowmobilers became stranded. Michigan Department of Natural Resources conservation officers responded to several emergency calls to aid snowmobilers Sunday, working through the night into the early hours of the next day. The storm raged through the area, shutting down traffic along M-28 between Marquette and Munising, dumping nearly 20 inches of snow near Negaunee and producing wind gusts over 60 miles per hour along the Lake Superior shoreline. In one rescue mission, two Marquette men, ages 30 and 31, were snowmobiling near Trail No. 8 when they got separated from each other due to low visibility from the blowing snow. Both of the riders' snowmobiles became stuck in 6-foot-tall snow drifts. Around 11 p.m., Conservation Officer John Kamps began assisting Marquette County Search and Rescue personnel in locating the two men. After looking for about an hour, one of the riders was found near the Lindberg Gravel Pit, north of Marquette County Road 480. It was several hours later before the second snowmobiler was located, about a quarter mile from where the first man had been found. Kamps then left the first search-and-rescue effort to respond to a second call for help along Trail No. 8, this one from a 52-year-old Marquette man who was stranded near the crossroads of County Road 480 and M-553. The man had been snowmobiling home when he became lost in whiteout conditions. His snowmobile got stuck in a 3-foot snow drift. Kamps and a volunteer search-and-rescue team member entered the trail on their snowmobiles in the crossroads area. After about 90 minutes of searching, they located the man, cold, but in good condition. The man had abandoned his snowmobile and walked the trail for 3 or 4 miles, searching for help. The man was given a ride back on the volunteer’s snowmobile. He was dropped off at a warm location around 1:30 a.m., where he was able to call for a ride home. In another incident, farther west, Leadman and conservation officers Josh Boudreaux and Brett Delonge responded to a Marquette County Dispatch call about three men from Ohio who were stranded along Trail No. 5. The men made several calls for help to emergency dispatchers after their snowmobiles became stuck in drifted snow covering the trail. Using GPS coordinates obtained from the 911 call, the conservation officers searched the trail for several hours before they located the three men around 1 a.m.
With the sleds stuck in the snow, the conservation officers transported the men on their patrol sleds a distance of about 7 miles before arriving at a convenience store located at Koski Corners. They got to the store, which is situated at the intersection of M-95 and U.S. 41 West, at about 3 a.m. There they were able to call a ride to pick them up. Neither of the snowmobilers required medical attention. During the storm, which was one of the fiercest to hit the area in some time, the Mackinac Bridge had also been closed, while countless local roadways were choked with snow and drifted over. Police and weather forecasters warned motorists that travel would be difficult to impossible during the storm, urging drivers not to travel unless necessary. While the sun broke through the clouds Monday afternoon over Marquette County, whiteout conditions persisted near Munising, with M-28 remaining closed. 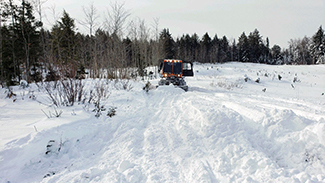 Sections of several snowmobile trails remained impassable for trail groomers, with trees downed and drifts higher than 8 feet in some places. The DNR reminds snowmobilers to always Ride Right to help prevent accidents and get everyone back home safe. Michigan DNR conservation officers are fully commissioned state peace officers who provide natural resources protection, ensure recreational safety and protect citizens by providing general law enforcement duties and lifesaving operations in the communities they serve. Blizzard conditions that ripped through parts of the Upper Peninsula Sunday have created numerous hazards for snowmobilers across parts of five counties. The storm crippled travel for motorists, with nearly 20 inches of snow dumped over some parts of Marquette County and higher amounts registered farther north in the Keweenaw Peninsula. Winds that surpassed 60 mph were clocked along the Lake Superior shoreline. Highway travel along M-28 between Marquette and Munising was shut down, while heavy loads of snow collapsed some rooftops. Areas hardest hit include the snowmobile trails located in Marquette, Baraga, Ontonagon, Houghton and Keweenaw counties. Snowmobile clubs are clearing drifts and downed trees with grooming tractors. Until trails are cleared, riders should expect to encounter deep snow, downed trees and rough trail conditions, with some trail segments impassable, especially in open areas. DNR conservation officers conducted several search and rescues Sunday after riders buried sleds in drifts along trails. “Snowmobilers who are inexperienced in riding in deep snow conditions are strongly encouraged to avoid the areas hardest hit, in favor or riding in the southern portion of the U.P., where the weather was not as severe and abundant snowfall this season has produced great trail conditions,” Katona said. Check the latest on trail closures and re-openings at Michigan.gov/DNRClosures. For the latest trail conditions, see groomer reports at msasnow.org/trail-reports. For more information on snowmobiling in Michigan, visit the DNR’s webpage at Michigan.gov/Snowmobiling. Editor's note: Photos courtesy of Dan Grove, Moose Country Snowmobile Club.